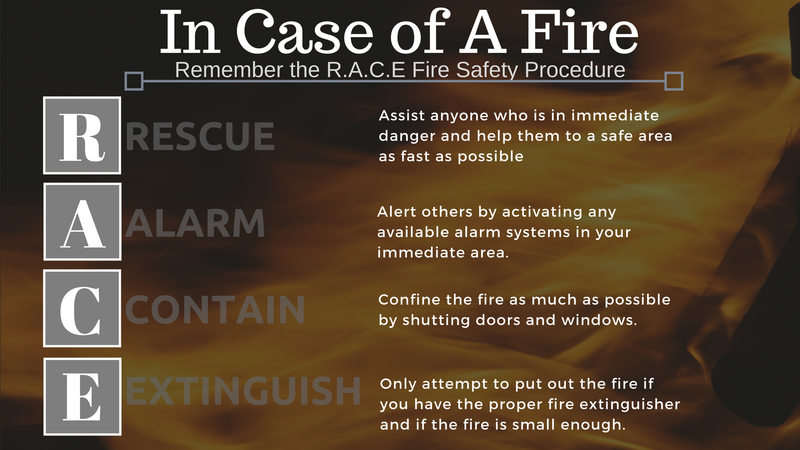 Home / R.A.C.E = RESCUE, ALARM, CONFINE, EXTINGUISH/EVACUATE. Fire related Injury or death has significantly declined over the years. Much of that is thanks to organizations such as OSHA, NFPA, NSC and others who have gathered, reviewed, and compiled fire related injury and death data to then make new and improved recommendations to help improve fire safety standards. R.A.C.E is one of the new procedures that has been developed and implemented to achieve these goals. As the number of deaths and injury due to fires continues to drop, Hospitals, businesses and various organizations have implemented the R.A.C.E procedure as part of their employee training. Whenever a fire breaks out, the human nature of some is to panic. Often times people are injured or killed because the panic creates a chaotic situation that can disrupt effective thought processes and decision making and lead to actions that are counter to what should occur. An example is people running in the wrong direction that can lead others to follow. If the fire alarm goes off or if you see a fire, you should stop whatever you are doing and take a quick scan around to help get you and others out and away from danger and to a safe predetermined area. Having the mindset of helping others has been shown to be associated with calmness and better decision making. Individuals who are Ambulatory (able to walk or move themselves ) should do so themselves. Individuals who are injured or otherwise unable to get themselves to safety should be assisted to safety. If it hasn’t already be triggered, and it’s safe to do so, activate the nearest fire alarm. If there are no fire alarm pull stations near you or on your way out, call 911 to report the fire once you are safe. Be ready to provide the operator with details of your location, the type and size of the fire and any other pertinent information such as known injuries. Close all doors and windows that you are able to safely reach in your immediate area and on your way out to help contain the fire, making sure not to block or trap others who may be escaping in the same path as you. If you are located near a fire extinguisher and the fire is still small with the probability of being extinguished, you should attempt to extinguish the fire. Remember to follow the procedures represented in the acronym P.A.S.S to extinguish the fire.